While not intending to do so, my fellow blogger, Joe Paduda has made a well-constructed argument for single payer health care, all the while examining the impact of health insurance status has on workers’ comp. The headlines were comforting – not much change in the number of Americans without health insurance. Before you breathe that sigh of relief, you’d be well-advised to dig a bit deeper, because there’s plenty of bad news just under the headline. While the national number of uninsured stayed about the same, that’s irrelevant to you – because healthcare is local. Here’s what I’d be worried about. Young adults are almost twice as likely as older adults to be uninsured – about one in six younger adults don’t have coverage. Takeaway – no health insurance = poorer health status, more comorbidities, more charity care for providers thus more incentive to cost- and claim-shift. 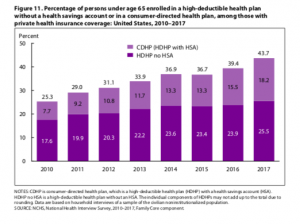 Takeaway – “High” deductible health plans aren’t much different than no insurance at all if the patient can’t afford the deductible – and over half can’t. So, more incentive to cost- and claim-shift. Workers’ comp will be affected by the Administration’s ongoing behind-the-scene effort to hollow out the ACA and cut funding for Medicare and Medicaid. It may also mean that the workers’ comp silo may have to be folded once and for all into the health care silo that will cover the elderly, the poor, children, the military and their families, and everyone else not currently covered under any insurance, or under employer-sponsored insurance, which would be done away with. So, Joe gave us an unintended gift by showing how health insurance status and workers’ comp may lead to the implementation of single payer health care. This entry was posted in Case-shifting, Cost Shifiting, Health Care, Health Insurance, Health Plans, Insurance, private insurance, Single Payer, Uninsurance, Uninsured, Workers' Comp, Workers' Compensation and tagged Health Care, health status, Single Payer, Uninsured, Workers' Comp, Workers' Compensation on May 25, 2018 by Transforming Workers' Comp. The Workers’ Compensation Research Institute (WCRI) published a new study that examined whether fee schedules increase the number of workers’ compensation claims. In previous reports, the WCRI found that in many states, workers’ compensation pays higher prices than group health. Another study they issued, found that in some states, workers’ compensation prices were two to four times higher than group health prices. Moreover, in most states, WCRI found, the workers’ compensation systems rely heavily on the treating physician to determine whether a specific patient’s injury is work-related or not. If the cause of injury is not straightforward (e.g., soft tissue conditions), case-shifting is more common in the states with higher workers’ compensation reimbursement rates. In particular, the study estimated that a 20 percent growth in workers’ compensation payments for physician services provided during an office visit increases the number of soft tissue injuries being called work-related by 6 percent. There was no evidence of case-shifting from group health to workers’ compensation for patients with conditions for which causation is more certain (e.g., fractures, lacerations, and contusions). It means that physicians seeking higher reimbursements are classifying some injuries as work-related, and that there is no evidence of case-shifting from group health where the cause is more determinable. What it also means is that no matter what the industry tries to do to lower medical costs, there is always a way for physicians and other stakeholders to do the opposite for their own benefit. And given that, you have to wonder why the industry is deaf, dumb and blind to alternatives that apply basic economic laws to saving money. If you can get a good or service at the same or better quality, and at lower cost, no matter where that is, you go there. It works that way when buying cars in one state, when the buyer lives in another state, and it should work that way with medical care, particularly regarding surgery. The industry should not listen to certain individuals who dismiss this idea, and call the locations where better or equal care can be obtained at lower cost, “Turkishmaninacanstans“. It demeans the hard work and dedication of medical professionals and business people who have spent years and money on building a business to provide health care that is affordable and of the highest quality. It insults the education and training of doctors, nurses, and medical technicians in those countries who otherwise might not be working in such a highly respect profession as medicine. It only proves that the author of that canard is a coward, a racist, and dead wrong. This entry was posted in Case-shifting, Claims, Claims Process, Cost Shifiting, Group Health Plans, Medical Tourism, Medical Travel, physicians, Providers, Reimbursement, Reimbursements, Surgery, WCRI, Workers' Comp, Workers' Compensation and tagged case-shifiting, Claims, Cost-shifting, Medical Costs, Medical Tourism, Medical Travel, Reimbursements, Workers, Workers' Comp, Workers' Compensation on April 14, 2016 by Transforming Workers' Comp. This entry was posted in California, Case-shifting, Claims, Conferences, Cost Control, Cost Shifiting, Cross-border Health Care, Direct costs, Group Health Plans, Health Care Costs, MEDICAL COSTS, Medical Tourism, Medical Travel, WCRI, Workers' Comp, Workers' Compensation and tagged California, Claims, Cost-shifting, Costs, Cross-Border Health Care, Health Care Costs, Medical Costs, Medical Tourism, Medical Travel, WCRI, Workers' Comp on March 10, 2016 by Transforming Workers' Comp.